Applying roof coatings is a growing industry with impressive profits to be made by professional contractors. In our climate, damp proofing is always a thriving industry with many months of the year offering damp proofing corrective and preventative projects. As a "KINGFISHER APPROVED ROOF COATING APPLICATOR" you will become eligible for discounts on many Kingfisher roofing products. Depending on the quantity and frequency of your purchases this could range between 15% and 30%. By becoming a "KINGFISHER ROOF COATING APPROVED APPLICATOR" we will not only teach you the technical aspects of roof renovation but will also offer guidance on how to market and develop your business. As a leading manufacturer in the structural waterproofing industry, we have a proven track record of training professional contractors in the application of our products and then supporting them with training and advice in the field. Kingfisher has been manufacturing structural waterproofing systems for over twenty years and as a "KINGFISHER APPROVED ROOF COATING APPLICATOR" you would also have access to our technical department. 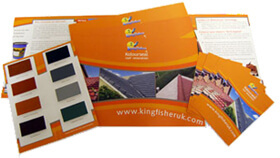 Kingfisher has designed and developed a range of marketing which is at your disposal to help promote your business. These can also be customised with your own contact details - click on the link below to see the items in more detail. As a "KINGFISHER APPROVED ROOF COATING APPLICATOR" you will be able to offer our 10 year dual guarantee which covers both the material and the workmanship to give your customer additional peace of mind. 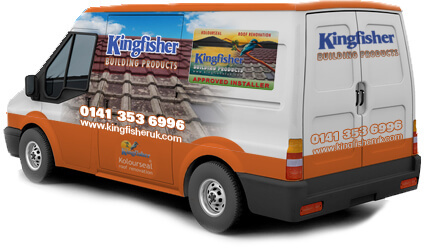 There are various franchise operators who will charge you fees of up to £15K to get into this business but you can get started as a "KINGFISHER APPROVED ROOF COATING APPLICATOR" for as little as £323.00. For more help and information, please ring 01229 869 100 or 0141 353 6996 to speak to one of the team for more information. Training Seminar at Kingfisher Factory, Ulverston, South Lakes. Issuing of "KINGFISHER APPROVED ROOF COATING APPLICATOR" certificate. Stock of Kolourseal Promotional brochures. Web site - our designer will build you a professional & credible web site. Web hosting and registration of domain name of your choice + 5 e-mail addresses. * During your "Provisional" phase you can still offer a Kingfisher guarantee but please notes that your work will be "vetted" and photographic records will be required at each phase. We may also contact your client for feed back regarding their impression of your performance. We offer seminars through out the year to teach tradesmen the most effective uses of our products and to allow you to refine your skills. Attending these seminars is the first step to becoming an approved Kingfisher contractor.